Paul R. Hare's article, "Hewlett & Blondeau", relates how a British woman, Hilda Hewlett, and a French Aviator, Gustav Blondeau created a partnership that led to the establishment of the first flying school in England, and a business that later produced aircraft for the Royal Air Force in WWI. The article clearly demonstrates that Hewlett was not only a competent pilot, but also a rather independent and talented entrepreneur. A.D. Harvey shares the diary of pilot Captain Gerald Ernest Gibbs of the 17 and 150 Squadrons, and his experiences on the Macedonian Front. The actions described in the diary take the reader directly into the action in a vivid manner. "In Good Company - Part 2, by Stewart K. Taylor picks up the story of Lt. James Archibald McGinnis from the initial article, Part 1, contained in the previous Cross & Cockade magazine. One of the lengthier articles in this issue of C&C, the reader gets a close up view of the day-to-day life of McGinnis and his mates. Part 2 brings the McGinnis story to an end. Most of the literature that one can find related to the air war focuses on the airmen and even the aircraft. Johanna Rustler's article, "Farnborough: The World of the Air Mechanic During the Great War" clearly shines a well deserved spotlight on those who kept the airplanes ready for action. The article focuses on the Southern Aircraft Repair Depot in Farnborough as it was the most important training facility in Britain. Just as pilots had to possess a certain set of skills, so did the Air Mechanic. This article describes the entry requirements and exams, living conditions, and nature of life at the Farnborough center. For those wishing to find more information on this topic the author provided an excellent list of primary and secondary sources. This issue of C&C introduces a multi-part article by Mike Kelsey focusing on the BE12, which Kelsey named the "Jack of All Trades". Kelsey includes information about the BE12 and its exploits on the Balkan, Struma, and Macedonian Fronts. As one of expect, the BE12 evolved, with modifications being made to what was a very successful aircraft. Part 2 of this article will appear in future C&C publications. If you've ever been to England in November you have seen images of poppies, gardens of poppies, and many small plastic poppies that are used as lapel pens. The poem by John McCrea, "Over Flanders Fields", is very well known. The article, then, by Andrew Thomas, should strike a cord with historians and modelers alike as it speaks to the actions of 2lt, Sydney Parker who piloted aircraft over Flanders Fields. Parker wrote an account of his role in the air war some 40 years after the event and it is this documentation that Andrew Thomas uses as primary source material. It is a fascinating and enlightening story. The final article in this issue is written by Barry Gray and is entitled, "German Hangars and Aeroplane Sheds, Part Three". The photographs and scaled drawings of various structures will surely be a valuable resource for those in the modeling community. There are some "columns" that are standard content for C&C. "Fabric", by Mick Davis, provides Q & A coverage. "Obituaries" reports the passing of members of the First World War Aviation Historical Society, listing their many contributions to that society. "Modeling" contains a review of the Valom 1/144th scale Sopwith Pup, and some additions to the product line of Eduard and Wingnut Wings, two companies that modelers hold in high regard. Lastly,"Bookshelf" offers a description of seven new releases, all dealing with WWI aviation. This publication is highly recommended due to the excellent articles, based on primary source documentation, accompanied by many black and white images. 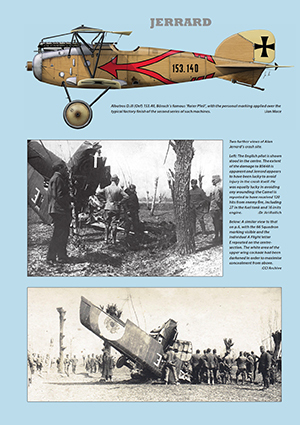 If you are into early / WWI aviation; this journal is an incredible source of information that will have you on the edge of your seat for the next issue. Thanks to Cross & Cockade International and IPMS/USA for the chance to review this great issue.